Dianne Doyle, head of Providence Health Care, is the keynote speaker at the BC Leadership Prayer Breakfast. Every spring the BC Leadership Prayer Breakfast draws more than 1,000 people together to offer support and prayer for those who serve in elected positions at municipal, provincial, federal and international levels. Our speaker this year is Dianne Doyle, president and chief executive officer of Providence Health Care. Dianne leads from a faith-based perspective, with a focus on integrating compassion and social justice within the BC health system. 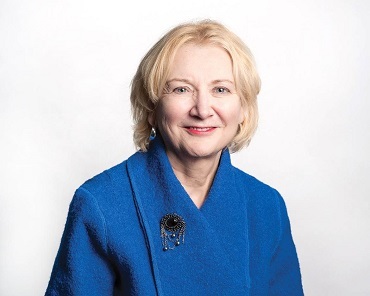 She is also the recipient of numerous leadership awards including a Lifetime Achievement award from the Health Leaders Association of BC, a top 100 Most Powerful Women from the Women’s Executive Network and an Award of Distinction from the College of Registered Nurses of BC. The Provincial Leaders Dinner is a special gathering of the faith community on the eve of the BC Leadership Prayer Breakfast. It is an occasion for people of faith and for those who support the Prayer Breakfast to come together in an intimate setting in order to share dinner and conversation. Our speaker for the evening is Shannon MacDonald. Shannon is the managing director of Health and Social Services at Accenture. She recently retired as vice chair from Deloitte, is a former senior partner and was a member of the Deloitte global board of directors. Churches are offering shelter to the homeless in Maple Ridge, seven days a week. Maple Ridge Baptist Church welcomed them during February, and Burnett Fellowship Church has taken over in March. The program is organized by Hope for Freedom Society, which uses their van to pick up people who haven’t got a place to stay and drops them off at the church, where volunteers will give them a mat, feed them breakfast in the morning and provide a bag lunch before they leave for the day. The Mat Program ran for nine years in the Tri-Cities, and Rob Thiessen of the Hope For Freedom Society touts it as a huge success in helping people on the streets there, as it would house and feed 30 people each night. He said it was also good for churches. “This stretched them, and put them out of their comfort zone, but I’m a church guy, and I speak church.” . . . He said some members of the public had been against homeless housing initiatives in the Tri-Cities. “Showing up with pitchforks and torches,” is how Thiessen described it. He liked to challenge those who were most adamant to get involved by volunteering with the Mat Program, and some did. 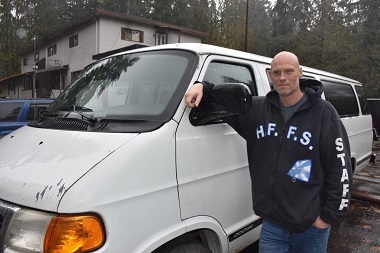 He recalls one detractor of harm reduction programs serving meals, and the first guy he sat down and talked with was a former schoolmate. . . .
[The program] ran in Tri-Cities . . . helped provide shelter until the 30/30 Gordon facility was built there. Thiessen hopes to similarly fill a gap in Maple Ridge. CBC Radio’s Early Edition also interviewed Thiessen, March 13 (go here and begin listening at 1:30:30). Homelessness is a hot button issue in Maple Ridge. An ongoing tent city at Anita Place has been met with some fierce community opposition, and council has seen heated debate around where to build new supportive housing. Now a faith-based group called Hope for Freedom wants to help homeless people come in from the cold and build bridges within the Maple Ridge community. We have had nothing but support from local civic government and from other resources in the community, and business and so on. We haven’t had any push-back at all. . . . Probably because we run a fairly tight ship. We can offer people a restful night’s sleep, without a lot of the distractions that occur in some other places, and I think the community feels more comfortable with a little more controlled environment. . . . The funding is provided by BC Housing, who provide us funding to pay our shelter workers and other expenses, and then the community. The churches provide their facilities for free, the local food bank provides the food for free, and the churches also provide volunteers who do the work. So my calculation of the dollar value of the community in kind is about $66,000 for a three month period. The plan is to run the program through the end of April – they’re still looking for a church host – and then start up again in October for six months. Holy Trinity Cathedral has big plans for its site. There are two Holy Trinity parishes locally, the cathedral in New Westminster and the church in the south Granville area of Vancouver – and both have building-related news. Holy Trinity Anglican Cathedral, one of the oldest churches in BC, is moving ahead with major redevelopment plans. It is located just up the hill from Columbia Street in New Westminster. 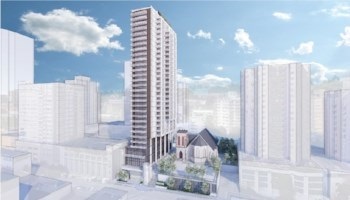 Holy Trinity Cathedral and Conwest Ventures Ltd. propose a 30-storey mixed-use building that includes a new Parish Hall for the Holy Trinity Cathedral, 42 affordable rental units, 30 market rental units and 173 market ownership units. The development will include 4.5 levels of underground parking to service the Cathedral, Parish Hall, and occupants of the building. The Holy Trinity Cathedral will undergo a seismic upgrade and a heritage revitalization. The proposed development also includes an accessible mid-block connection from Carnarvon Street to Clarkson Street and a community plaza. Parkade access will be off of Clarkson Street. This will allow the next phase of the project to begin with public consultations and to work with the City of New Westminster and their consultants to design both the tower and the seismic upgrade on the Cathedral. This exciting project has been in the works since 2011 and has had a history of coming up against a few barriers; it is great to hear such good news. Construction is not projected to begin until Winter 2020. For a 2014 article about the church’s redevelopment plans on Church for Vancouver go here. Does it matter what a church building looks like? Christian church buildings have come in many shapes and sizes over the centuries and all have housed faithful Christians worshiping the one true God. On the other hand, these buildings have expressed and formed the faith of congregations in different ways in different times and places. Does it matter how a church interior is arranged? Ordering space for worship has been varied and creative. Differing theological perspectives have produced quite diverse solutions. Anglicanism has both benefitted and suffered from movements designed to address challenges faced in the interior arrangements of church buildings. Rev. Dr. Brett Cane – an architect and an Anglican cleric – will give us a whirlwind tour of church building history, showing how different styles emphasise different aspects of the Christian faith. He will show how the interior arrangements of Anglican churches have evolved over the centuries, revealing that “how we have always done it” isn’t exactly the case. The morning will conclude with discussion of how space can be arranged appropriately and expressively for Christian worship. This night of music and meaning will feature 2018 JUNO Award nominees Jon Neufeld, and The Color, as well as Coastal Church’s own Warren Dean Flandez and his high energy, soulful, gospel choir. Come ready for a night to celebrate and worship. The evening will also be in support of ACTS, which provides clean water to communities in Uganda. 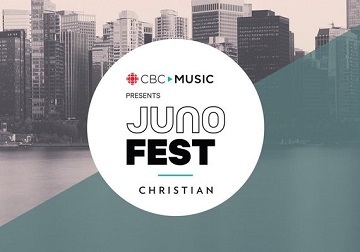 JUNOfest is a music celebration sponsored by CBC Music. Some 95 artists can be seen at 15 stages across Vancouver March 23 and 24. Juno Week – an annual event which celebrates Canadian music – takes place March 18 – 25 and the Juno Awards ceremony will be held in Vancouver this year, on the final day.